Today I’m excited to be participating in the Chippmunk Expert Shopper Style Challenge – I was chosen along with my girls Marion, Tara & Shanna to put together summer looks for $150 or less using coupons we found on Chippmunk. If you haven’t heard of their site before, it is THE place for finding the best deal based on your budget. There are more than 400 stores in their database and their promo codes are guaranteed to work. I love that you can search for coupons either by choosing a department & entering the budget you have to work with or by looking up a specific store…they make it so easy! And now for some exciting news – Chippmunk is giving away $750 in store gift cards!! In round 1, five “Most Loved” people will win $100 each. 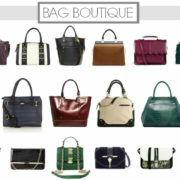 In Round 2, one of those winners will be chosen by my fellow bloggers & I to win an additional $250! Just upload an image that conveys your own personal style to the Chippmunk Expert Shopper page, and share your tips for other budget minded shoppers. Be sure to share your look with friends to get more “love”! In Round 1, “Most Loved” winners are determined by “love it” clicks. Each Round 1 winner will receive a $100 gift card to their favorite store. In Round 2, one of the five “Most Loved” winners will be chosen as the “Editor’s Pick” by myself & my fellow bloggers to win the $250 grand prize. To be considered for the grand prize, “Most Loved” winners will submit a description of what awesome steal they would create with $250 in the form of an image created with their outstanding outfit. The contest closes at midnight PST on June 18th, and “Most Loved” winners will be announced on June 21st. Disclosure: My entire outfit (excluding the accessories mentioned above) was purchased using a gift card c/o Chippmunk. Love the jean shirt with the white pants! It's a very clean and classy look! I have never heard of this site before. Will be checking it out for sure! Thanks for sharing..
i really love that tote!! Such a cute outfit! I love the pop of color you added w/ the pink bag and lipstick! I love Revlon's lipstain's! This one your are wearing is so gorgeous! Will totally be going out and trying it! Love your aviators and white jeans! Perfect for Summer. You look so pretty. Love this look! That's my kind of outfit! Kim, you look super pretty! 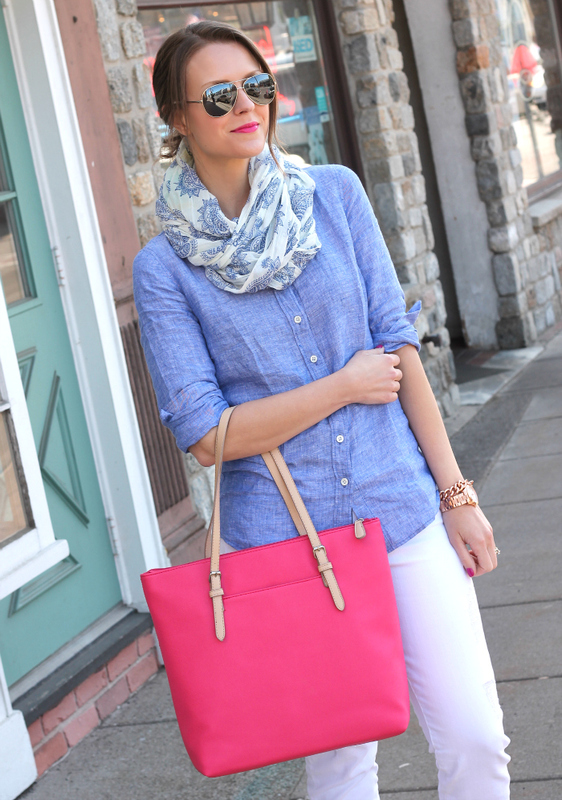 Love how your pink pout matches your tote just perfectly, and that chambray shirt is so great! This is so cute, summery and classic. I have that tote in cream. Didn't know it came in pink. Love it! Love the outfit, especially the scarf. Perfect with a chambray shirt!! Great finds at great prices!! I've never heard of the site but I am definitely going to check it out! Wow ~ that's some serious bargain shopping ~ and such a cute casual look. I especially love the scarf and those jeans look great on you! Love this looks – as usual very classy! Lovely & chic summer look….great style job Kim!!! love this, and totally checking out those jeans… wish i saw them at 40% off! amazing find, and totally agree about investing in quality pieces to balance everything out. 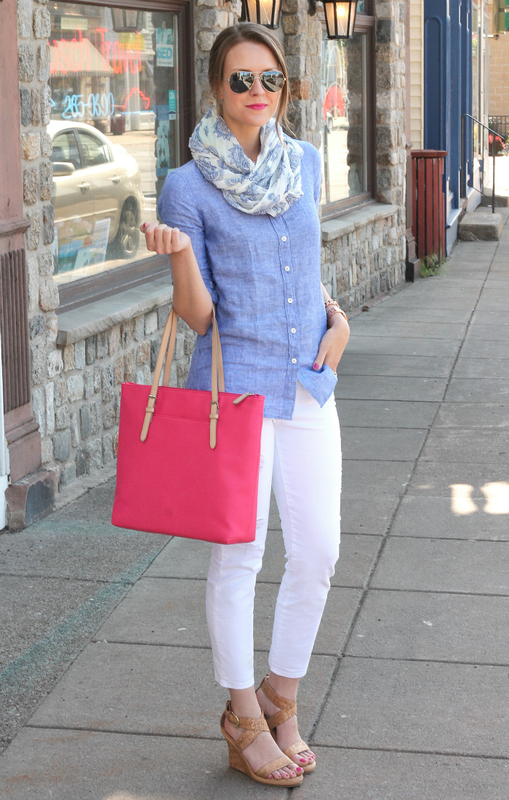 Love this look, the bag adds the perfect pop of color to this outfit! Love this look Kim! So breezy and classic! LOVE! Obsessed with this look, but even more excited to try out Chippmunk! Your bag is so pretty, love the color! Such a fun summer look Kimberly! You look beautiful. And I totally agree with Alyson…you totally scored on those jeans! Excited to team with you to share Chippmunk! I love the outfit you picked! That shirt is fantastic! I love the pop of the pink tote!! 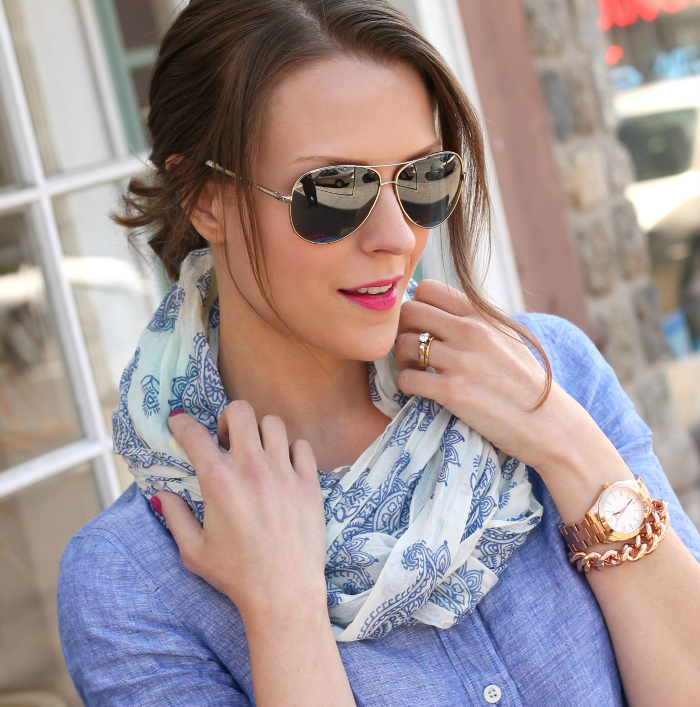 Even in Summer I still love a scarf! Really adds some extra style to any outfit! Love!!! Love this scarf!! Never heard of Chipmunk, seems like a great place o find deals and sales! Hope you are having a wonderful day! Gorgeous as always. Love this classic & chic look you put together. It has been such a pleasure to work together on this project! 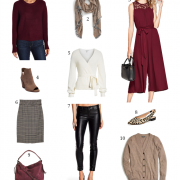 Love the outfit you put together and this is such a fabulous idea for a site! I find "popularity" type contests (where the winner is chosen based on likes) a little intimidating so I'll probably pass on this one but good luck to everyone else! 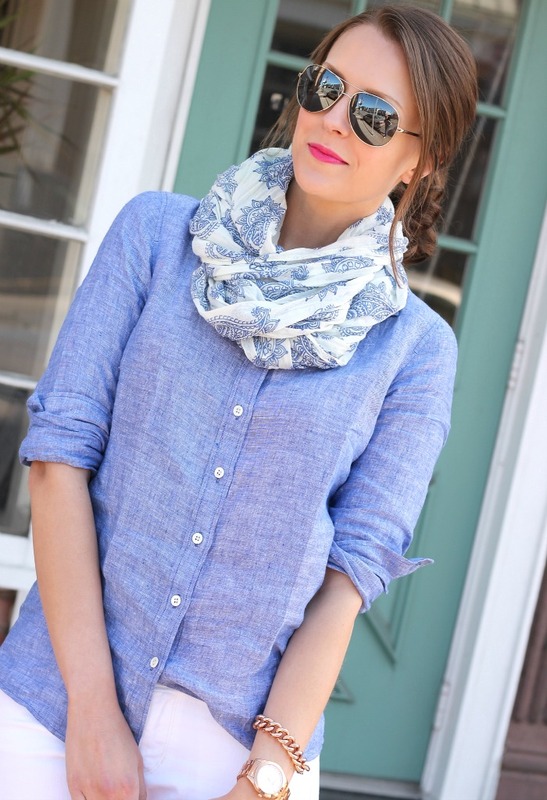 Chambray and white! I must copy this look! Oh this outfit is just too cute! That scarf is adorable. So happy to be working on this project with you…love the outfit you came up with! You look fabulous! I love the top and the scarf and that bag is amazing as well! this is such a clean summer look…absolutely love it! You spent your $150 so well! Great outfit from head to toe. Love the shirt. Question: whereabouts do you live upstate ny? very curious as this was my travel route when i worked as a tour director two summers ago (back in europe now). i LOVE LOVE LOVE THE finger lakes area! I love how classic and simple this is! One of my favorites of your posts– so fresh and feminine!